Kaplan's GMAT Math Workbook is designed to help you build a strong foundation in the essential math skills you'll need for the GMAT. Focused review, practice questions, and test-taking strategies will help you master the material and face the test with confidence. 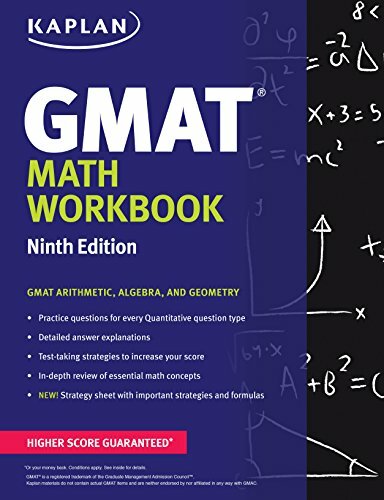 Kaplan is so certain that GMAT Math Workbook offers all the review you need to excel on the test that we guarantee it: After studying with this book, you'll score higher on the Quantitative section of the GMAT—or you'll get your money back. Welcome to the MBA Book Shop - the most up to date collection and selection of the best study materials and MBA Application Guides. Disclaimer: GMAT® test is a registered trademark of the Graduate Management Admission Council®, and this site has neither been reviewed nor endorsed by GMAC®.